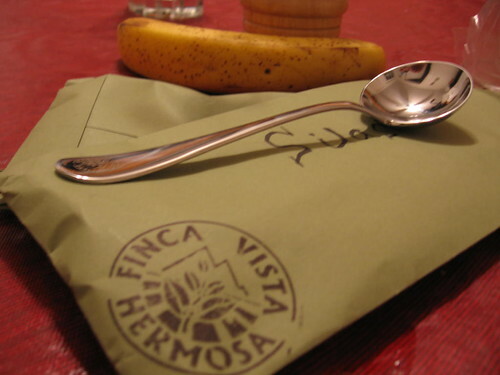 Big props to my friend Edwin for sending us some monogrammed cupping spoons. It's actually the first real cupping spoon I ever had. I don't think I ever really thought about buying one for myself because that's how we are. I kinda cringe at being the person who walks into a cupping with spoon on belt/over the ear/tied to arm. Yep, we all know one of those types. Still, it's sweet to have one so maybe I'll have to get a bandanna for my arm to carry it around now. I am looking forward to Eddie and Nina's visit and hopefully it will prove as entertaining as when Blanco dropped in. This all goes to remind me that Friday will be a travel day out to Hingham to visit Bob's outfit, Redeye. Interested to see how he roasts the Panama 'Diamond Mountain' and the Gayo among others. Kaminsky and I will join a new kid who is opening a shop somewhere in the Boston area.